It will surprise no one that the works of J.R.R. Tolkien overwhelmingly feature male characters. After all, Peter Jackson had to invent characters in order to cast more than one actress in The Hobbit. 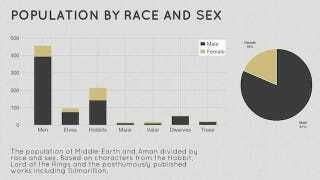 But just how big is the Middle Earth gender gap? Emil Johansson has undertaken a massive project to chart every corner of Tolkien's Middle Earth. He's creating a genealogy of every family, as well as synching the series' full timeline to an interactive world map. And some interesting statistics have come out of the project, such as the gender and race chart above. Just 19% of the named characters in Tolkien's Middle Earth books are female, and only female Dwarf is described: Dis, mother of Fili and Kili. If you want to lose several hours of your weekend, Johansson's website is a great place to do it. He's even charted the life expectancy of the different races, the age distribution, and the distance Frodo travels each day in Lord of the Rings. Just know that, if you haven't read the books, spoilers abound.